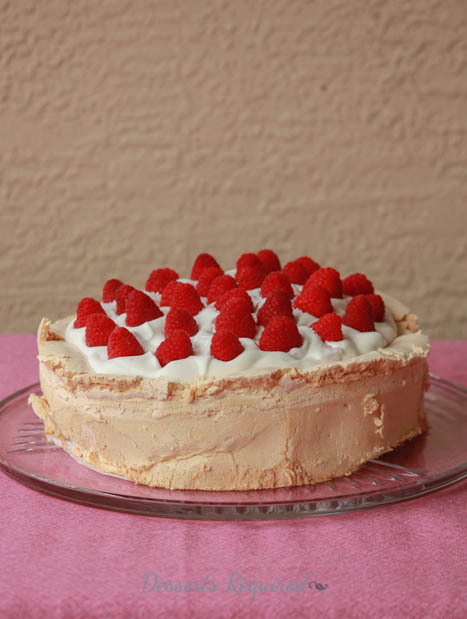 Heavenly Cassata was originally posted on January 9, 2012, way before I started making videos. I decided this past week that Heavenly Cassata needed a video. It is too great of a recipe for anyone to skip and, yet, I have been told that it seems too difficult to make. So, now you have a video to see for yourself how easy it is. You no longer have ANY excuse NOT to make your very own Heavenly Cassata. I come from a family of extremes. Some have been and continue to be amazing cooks and bakers, while others can barely find the kitchen. Grandma Syl fit into the latter category. Syl was one of a kind; she invented the word partying. Spending time with Syl always made me smile, except in the kitchen, because Grandma Syl never went near her kitchen. I can remember one Thanksgiving when we were all supposed to go to a friend of Syl’s for the big meal. The friends were called away with an emergency and brought all the food over to Syl’s. The ONLY thing Syl had to do was take the turkey out of the oven. She ended up with burns down both of her arms. Syl had a sister, Gertrude, who was a fabulous cook and baker. Fortunately, for all of us, Aunt Gert’s daughter, Linda Griffith, inherited that wonderful gene. 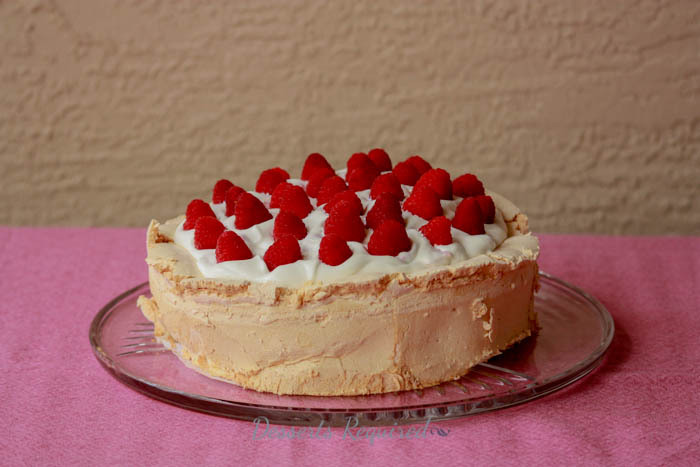 One of my favorite recipes from Linda is her Heavenly Cassata. This cassata is not like a traditional one, with liquor-soaked cake, ricotta cheese, nuts and various candied fruits, for which I am most thankful. 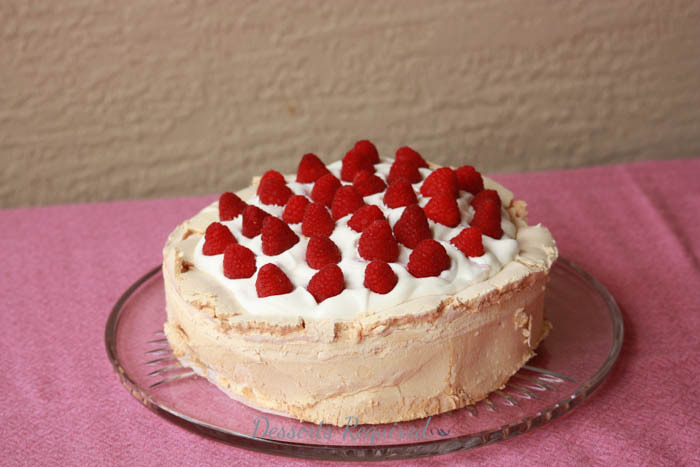 Linda’s version is light and creamy and filled with fresh fruit. More accurately, inside a meringue shell are macerated berries blended with whipped cream and sour cream. Then, as if that was not enough, the cake is topped with gorgeous berries screaming to be eaten. Linda lives in Cleveland, Ohio (I LOVE Clevelanders). I do not know if Corbo’s Bakery, a Cleveland bakery that has been around for over 40 years and whose Cassata Cake Mario Batali raved about, was an inspiration for Linda when she created her Heavenly Cassata. I am just so darn thrilled that she did. Whatever prompted Linda to construct her recipe as it is written is not really that important. What is extremely important is that we are all able to make and devour our own Heavenly Cassata. Believe me, the name is well chosen. Butter a 10” springform pan, line the bottom with parchment paper and then butter the parchment. Preheat oven to 325°. In a large mixing bowl, beat the egg whites and salt until very soft peaks form. Add vinegar. With the mixer on, begin to add the sugar, a bit at a time. Beat until the mixture is stiff and shining. Spoon the meringue into the prepared pan working around the edge first, using a large spoon to scoop the meringue out of the mixing bowl and a rubber spatula to scrape the meringue off the spoon. Once the edge has meringue scooped around it, transfer the remaining meringue into the middle of the springform. Smooth the meringue, leaving a well in the center. There will still be a layer of meringue on the bottom of the pan. Place the springform pan onto a piece of aluminum foil. Bake at 325° for 1 hour. Remove from the oven and cool. When the meringue first comes out, it will look like it is about to go flying over. Then it will fall into the pan as it cools. Remove ½ quart of the berries for topping the cake and set aside. Hull and slice the remaining strawberries, if using. Wash and dry all of the berries (except those being used for the top.) Toss with confectioners sugar and kirsch or raspberry liqueur and let sit for at least 45 minutes. Use a small metal spatula to go around the edge of the springform, keeping the pan closed. If there are any holes in the shell, move some of the meringue around to cover them. Beat the whipping cream until stiff. Fold in the sour cream. Add the berries to the cream using a slotted spoon so only the berries, and not the juice, are transferred. Spoon the filling into the shell. Cover with plastic wrap and refrigerate for at least 2 hours. Just before serving, decorate the top of the cake with the remaining berries. Remove the side of the springform pan. If desired, transfer the cake from the bottom of the springform to a serving plate. To do this, place two spatulas between the parchment paper and springform bottom (think of a clock and place the spatulas at 3:00 and 9:00.) Carefully lift the cake and transfer over to the serving plate. I measure the sugar in a measuring cup and then transfer the sugar to a 2 cup measuring glass. I find it easier to gradually add the sugar to the egg whites this way. The cake may be served from the springform bottom if you do not wish to transfer the cake off. Simply place the springform bottom onto a serving plate. I prefer a mixture of raspberries, strawberries, blackberries and/or blueberries. I base my selection of which ones look best. Do not assemble earlier than 6 hours before serving. This looks yummy! It also reminds me of all the meringue dishes my grandma used to make. Meringue makes me nervous, but I will attempt this one. This one is for your gluten free friends : ). We actually had a very similar one at a Chabad Rabbi’s home for Shabbat last Friday. Now, I am so craving it. How perfect that it is your dessert this week! You make it look so easy. If we all could bake like you! Thanks KJS. I know you will be able to make this Heavenly Cassata without a problem! i love the meringue shell. it looks wonderful! The liqueur for the berries really is soooo delish! Love how talented you are with your video, excellent job!! Amazing dessert, yes heavenly!!! Thanks so much. I have a great time making videos. Betsy, this cake looks and sounds amazing! I had a grandma like Sly, her name was Alda, and what a terrible cook she was. Good thing there were others to make up for it, or we would have gone hungry, and I would have never learned to cook. I LOVE grandmas like Syl and Alda and am, also, SO thankful that the two of us had others in our lives to share their love of cooking and baking!